According to Mirvac and Coombes Property Group, the shortlist of architects that will are competing to design what will become Sydney’s tallest residential tower now stands at six. The six finalist firms are: Fjmt, Bates Smart, Architectus + Ingenhoven, SOM + Crone, Foster + Partners and Wilkinson Eyre. The site at 505 George Street was sold in 2014 for $85 million, while the joint venture partners have a DA for a 260-metre tall building on the site. According to reports, the design for the mixed-use tower will include a retail podium, residential apartments, two childcare centres and a premium hotel. Mirvac’s head of residential Stuart Penklis says the design competition will ensure the finished structure building will reflect world-leading design, sustainability and the creation of public space that will enhance the community. “Sydney is one of the world’s great global cities and our CBD is currently going through an infrastructure boom. Wander the streets of the city and you can’t miss it; from the light rail construction to the many cranes in the sky working to create tomorrow’s city. “We expect the new mixed-use tower on George Street to set a benchmark for this end of town – to revitalise and enhance this iconic precinct with the right mix of retail, residential and community spaces,” says Penklis. “This is why we have looked around the world for the right architects to participate in the design competition and are thrilled with the selection of local and international firms who are participating. Last Friday we had architects fly from London, Chicago, and Dusseldorf to Sydney to attend the formal competition briefing at Mirvac’s head office,” says Penklis. Up until now, the mantle of Sydney’s tallest residential tower was held by the soon-to-be competed 235-metre Greenland Centre. Designed by BVN Donovan Hill and Woods Bagot, the 66-storey tower sits on the former Waterboard site on Bathurst Street in the Sydney CBD. 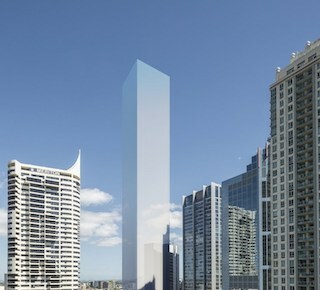 Mirvac has said that the architectural design competition winner for 505 George Street will be announced mid-year.